Philadelphia, located at the mouth of the river Delaware to the Atlantic Ocean, is the largest city by population in Pennsylvania, and the sixth in the USA. In colonial times was the second most important city of the British Empire, after London. It's the place where the Declaration of Independence was proclaimed, and the United States Constitution was written. Before Washington was founded, Philadelphia had been the capital and the largest city in the country. It is also a well-known academic center with universities, medical schools, colleges, and has the second-largest student concentration on the East Coast. Forbes ranked Philly 12th among the top 40 cities for singles. 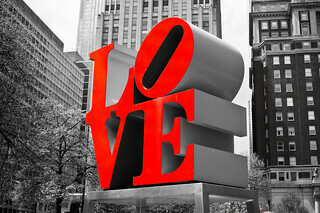 Here are some tips for dating in Philadelphia. Philadelphia is a city with many interesting places worth seeing. One of the most typically associated with it is certainly the Old City district with Independence National Park, in which the Independence Hall is located, the place where Declaration was signed, and the Liberty Bell. Nearby you can see the beautiful eighteenth-century buildings: the old courthouse – Congress Hall, old City Hall, on top of which stands 12 meters tall figure of Philadelphia founder – William Penn, and Christ Church with the mausoleum of the signatories of the Declaration. You can also find here the oldest street in the whole United States – Elfrath's Alley. Philadelphia also has the only home of Edgar Allan Poe that survived till present day. One of the most important relics of the city is nineteenth-century prison Eastern State Penitentiary. Dating in Philadelphia is easy for history enthusiasts. There are plenty of museums. The most interesting of them include Pennsylvania Academy of the Fine Arts (which is America's oldest art school and museum), Rodin Museum with one of the largest collections of works by Auguste Rodin outside of France and, finally, one of the largest art museums in the country that is the Philadelphia Museum of Art. The museum is also known for the 72 stone front steps, "Rocky Steps", as a result of their appearance in the triple-Oscar-winning film Rocky. 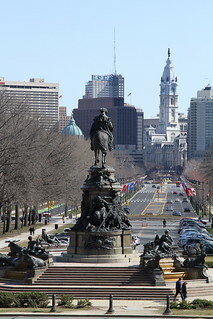 The Avenue of the Arts in Center City is a street with many fine, lavish restaurants, and major cultural institutions. One of the most famous of them is Kimmel Center for the Performing Arts, which houses the theaters (Merriam Theatre, Wilma Theater, and Suzanne Roberts Theatre), Philadelphia Orchestra and the Academy of Music. Along the avenue there are also Clef Club of Jazz & Performing Arts and the previously mentioned Pennsylvania Academy of Fine Arts. Worth mentioning is the fact that in Philly there are more than 2,800 murals (the biggest number in the U.S.), often painted by well known artists that were created thanks to the Mural Arts Program. Philadelphia is a city of many festivals. The best known of these are: Philadelphia Film Festival, the Philadelphia International Auto Show, and Subaru Cherry Blossom Festival. The latter one promotes Japanese culture through demonstrations of martial arts, ikebana flower arranging, as well as live musical and dance performances. Don't miss the opportunity to attend it. 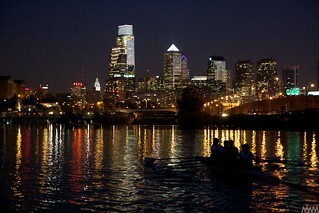 Definitely it is a great idea for a successful date in Philly. Philadelphia is a multinational city, to which many immigrants have come over the centuries. The whole cultural mix was not without some influence on the cuisine, which is known primarily from hoagies, scrapple, soft pretzels, water ice, Tastykake and cheesesteak (you can try them at Dalessandro's or Pat's). There are many restaurants in the city, both the cheaper and more upscale ones (Le Bec-Fin, Morimoto). One of the most widely liked is The Prime Rib – ranked among the top five romantic restaurants in the country. Many chefs of local restaurants have been honored with nominations for James Beard Awards. The most widely represented cuisines in the city are: Italian (Fiorino, Superior Pasta Company), French (Wedge + Fig, The Pickled Heron), Chinese (Heung Fa Chun Sweet House, Nan Zhou Hand Drawn Noodle House), Indian (Sitar India), and Japanese (Sagami Japanese Restaurant, Doma). Philadelphia is a city that should be associated with fun. Number of bars full of people all the time, clubs playing different genres of music, and restaurants serving delicious food are here. South Street and Old City are the spots where the city's nightlife focuses. If you find yourself in the area and you want to go to the bar, you should visit McGillin's Olde Ale House, well known for a great atmosphere, delicious food and Texas Hold 'Em nights, or Eulogy Belgian Tavern which boasts of more than 300 brands of bottled beers and 20 straight from the barrel. Nearby the Lucy's Hat Shop is located which is often full of students because of its famous happy hours. There are lots of clubs in the city therefore dating in Philadelphia for clubbing lovers is very easy. The most popular and, in our opinion, one of the best, include The Fluid, The 700, and Silk City Diner & Lounge.